This North American style, multipurpose push button switch and clear Mini Stopper II cover protect a wide range of applications indoors. The button incorporates a unique, patented design and the clear cover helps prevent accidental activation. 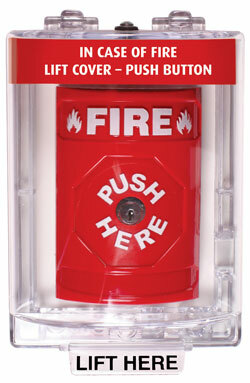 The highly advanced Stopper Station push button switch is ADA Compliant. Raised FIRE and flame symbols molded into product. Unit has Push-to-Activate, Key-to-Reset button. The Mini Stopper II offers excellent protection against physical damage (both accidental or intentional). Consists of a clear, super tough polycarbonate shield and frame that fits over manual pull stations. Cover contains no horn.